Dr. Lisa Jeziorny Kerouac is a board certified primary care optometrist. Dr. Jeziorny Kerouac joined the Dunlap Vision team in 2011. She is a member of the American and Illinois Optometric Associations. Dr. Jeziorny Kerouac graduated with honors from Illinois College of Optometry (ICO) where she was a member of Beta Sigma Kappa, the International Optometric honor society. While at ICO, Dr. Jeziorny Kerouac received training in all aspects of vision care at the Illinois Eye Institute. Her clinical education included primary care, advanced care, low vision, pediatrics/binocular vision, and contact lenses. During her fourth year at ICO, Dr. Jeziorny Kerouac also gained experience at off-site clinics like The Lighthouse for the Blind and The University of Chicago in the pediatric ophthalmology department. Prior to graduate school, Dr. Jeziorny Kerouac attended Lake Forest College and earned a Bachelor of Arts degree in Biology, while also participating in collegiate athletics as a three-time softball conference champion and an All-American handball player. It was during her tenure at Lake Forest that Dr. Jeziorny Kerouac discovered her passion for vision and eye care. 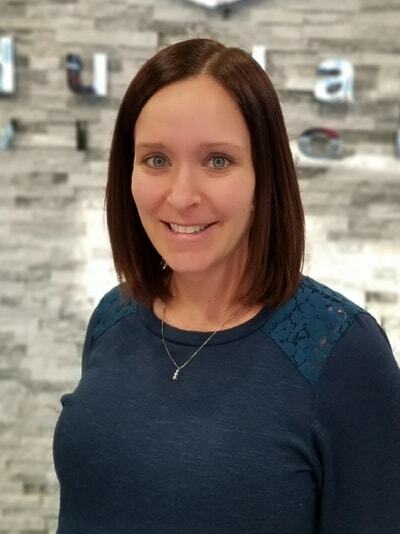 Dr. Jeziorny Kerouac was born and raised in the southwest suburbs of Chicago and currently resides in Bourbonnais, Illinois with her husband Tim and daughter Nina. Best place for vision hands down! My three year old had her first eye appointment. I was very impressed with all staff. Clerical, nurse, Dr. Dunlap, and the lady who helped pick out glasses. It was a long and somewhat traumatic experience for my daughter, but I'd say the experience was about as good as it could be. If you need to take your toddler to an optometrist, I would highly recommend! Excellent, caring staff. Great at what they do and they are kind/patient with my kids. Love the new office, very nice place! Love this place. I’ve been a patient of Dr Dunlap’s for years. Turns out, we attended the same college (years apart, of course), which makes him extra cool. He’s always very thorough, calm and cool. He answers any questions you may have and he remembers details about you and your life that you would think he’d forget due to his amount of patients but no, everyone gets a personalized experience and he makes sure to form and make that bond with you as your doctor. Dr D will always be my eye doctor, as long as I live in the area. My husband and I love Dunlap vision! The staff is kind and helpful. Dr. Dunlap is professional and thorough, and he's quick to answer any questions or concerns. I would (and often do!) highly recommend Dunlap Vision to anyone looking for a kind, professional and reliable eye doctor. I had a wonderful experience with my visit. I had a question about my bill and staff was swift with their response and receptive of my concerns. Everyone in the office was helpful when I was in for my appointment. I have referred everyone in my family to switch to this office!